How you cook crispy chicken wings with eggs depends on whether you use your oven or stove for cooking. Eggs are leavening agents that allow air into the batter, causing it to rise slightly during cooking and in the process become crispy. You can accomplish this by using eggs and a dry ingredient coating separately or by adding eggs as an ingredient in a liquid batter. Crack two large eggs into a shallow bowl. Add paprika and black pepper and then stir to break the eggs yolks and combine the seasonings. 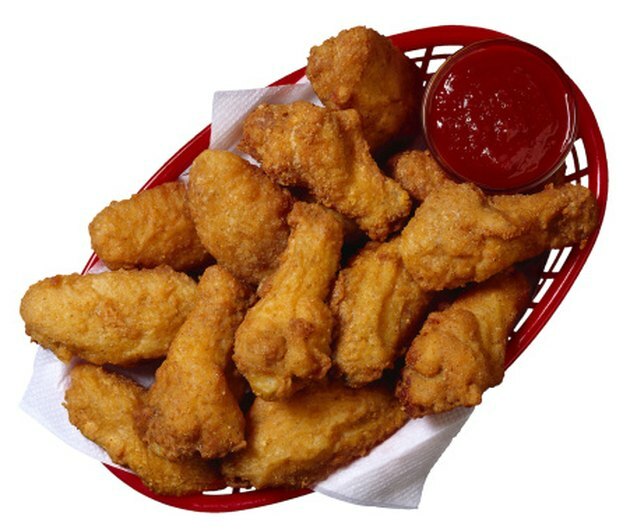 Add 3/4 to 1 cup of flour for every 12 chicken wings to a second shallow bowl. As an alternative to flour, you can also use plain or flavored breadcrumbs, crushed cereal flakes, tortilla chips or a combination of dry ingredients. Preheat your oven to 450 degrees Fahrenheit. Line one large or two medium-size baking sheets with aluminum foil. Coat the foil with vegetable oil spray. Dip up to six chicken wings at a time first in the eggs, turning the wings to coat the surface. Transfer the wings to the flour mixture. Coat the wings with the dry ingredients, using clean hands to gently mound and then pat the flour onto the surface of the wings. Arrange the chicken wings on the baking sheet or sheets and cook the wings for 40 to 45 minutes until they turn a crispy, golden brown. Pat the chicken wings dry with paper towels. Crack and add two large eggs to a mixing bowl, add the red pepper sauce and stir lightly to break the egg yolks. Stir in the cornstarch or flour along with up to 3 tbsp. of water, stirring the mixture forms a smooth batter. Pour canola oil to a depth of 1 1/2 inches in an electric skillet and heat the oil to a temperature of 350 degrees Fahrenheit. Dip the wings in the batter using tongs and then immediately transfer to the skillet. Fry the wings for about five to seven minutes or until they turn brown and crispy, turning once with tongs during this time. Transfer to several layers of paper towels to drain. If you use more than one baking sheet and your oven is not big enough to set both sheets on one rack, rotate the baking sheets after about 20 minutes of cooking. If you add too much water to the frying batter, adjust the consistency by stirring in additional flour, 1 tsp. at a time.